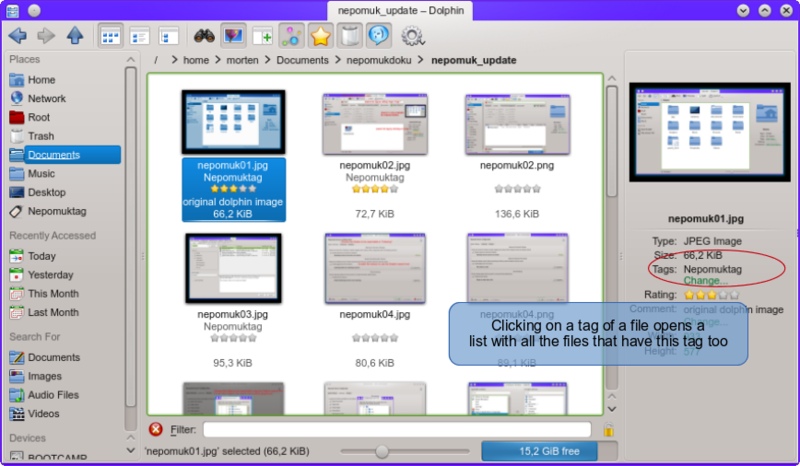 Since KDE 4.13 I' am using tags in dolphin and then searching them with baloo. It's awesome, I love it. You can tag a video file for example with a "cute cat" tag, and some time later you can find that video with a "cute cat" tag very quickly without have to see all your videos. It's very usefull , but the GUI it's not very powerfull. I can select one tag at a time, but I can not select two or more tags to make a better search. Have some way to select the tags you want from tags list for searching files would be awesome. Would be awesome if we can make a design for a better GUI to search tags, that can help Vishes Handa (Baloo developer) or Dolphin's developers, to develop it. 3) ¿A new way to insert tags in dolphin's panel? Note1: I don't know if Vishes or another developer is thinking or developing this in some form already. Note2: I don't know if this can be posible with actual Baloo or Dolphin. Yes, the tagging UI definitely should be improved, because it's an awesome feature that everyone should be able to use! In Plasma Active, for example, we made the tagging and filter-by-tag UI much more prominent. See this video for a demo of the UI. There's also the idea to use a natural language oriented search syntax with a drag&drop UI, see this thread for details. I even didn't notice that there is a tagging function. I removed the sidebar to have more space. I tried for ages to find out how to search for tags. I always tried "tags://" and never got any results I knew how to set them but never how to search for them, so they kinda loose their usefulness. This thing really needs an overhaul. Pressing the 'tag' button in toolbar starts the editing of tags. Tags always have a color, because humans usually can identify colors very fast. If you add a tag, you can choose the color. If you right click on a tag in the tag selection, you can remove it or change some properties (color, ...). Tags are added by dragging them onto the file or folder, the tags appear directly on the folder entries. If you want to remove a tag, you drag them away. It also should be considered to add a 'tags' panel to file/folder properties. I like the talk about tags. because they could be very useful, but at the moment difficalt tu use. The Idea with colors is nice, but you should have standard color and if you want to switch, you can change the color. Another Idea was, use the color for the amount of taged files. When you use tags, you need a tag sidebar. you can label files when moving them to the sidebar entry. When you use tags, you need some type of grouping or sort. I use tags in digikam, there the tags are like a directory tree. when you tag your files, you also want to use the tag tree in the file dialog to grap some files. In my opinion file labeling should look like a directory tree with tags as folder. But I don't know it look old school. In the tag tree you can use the color and the first letter as "icon". Colors should be consistent in my optinion, but a 'changing color' could be added as extra color for tags. So you could choose an 'Tag member count' color and the color will change. Yes. Additionally there should be tagging by file properties, too. Good ideas! But we have to be careful not creating something looking too 'scientific'/abstract. It should also look easy and should be easy to access. You should also can edit the tags and rating inline to. or a tag button in the icon bar like you know it from gmail. I know. I think it is a good way, but have to look more fancy than the directory tree. This implementation has been developed?